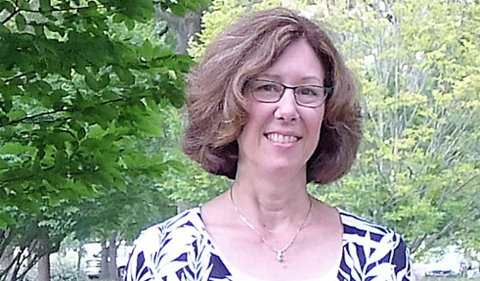 Dr. Kim Thompson, Environmental & Plant Biology Lecturer, received a $10,000 Zero Impact Fund award from PepsiCo for her proposed project, Advancing Sustainability at Ohio University with a Green Roof. Green roofs incorporate vegetation on rooftops, increasing energy efficiency through insulation and heat offsets, reducing and purifying stormwater runoff, increasing biodiversity, and improving air quality. Compared to traditional rooftops, green roofs offer protection from UV damage, increasing their lifespan and reducing waste. Funding will support the first planting as well as equipment to collect data on water runoff and quality and heat offsets. Read more about PepsiCo Recycling’s green initiatives in the University Chronicle. 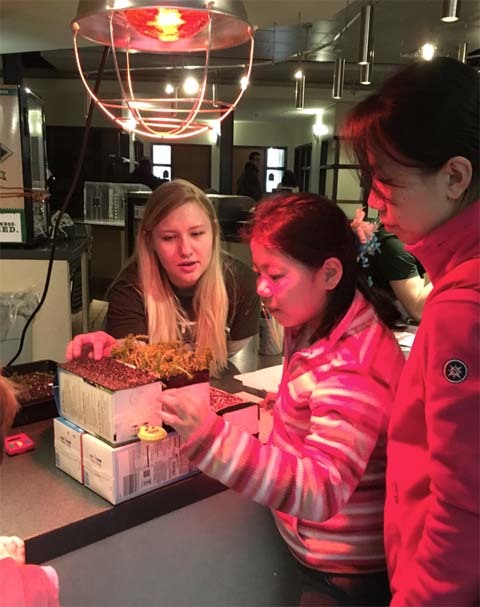 Rachel Crum, engineering major and Plant Club member, helps a young student collect data on changes in temperature inside each of the rooftop models after the heat lamp is turned off. The green roof also receives support from the Academic Innovation Accelerator administered by the Office of Instructional Innovation. Faculty from the College of Arts & Sciences, Voinovich School, Scripps College of Communication and Russ College of Engineering are collaborating to develop this new educational and research ecosystem on campus. 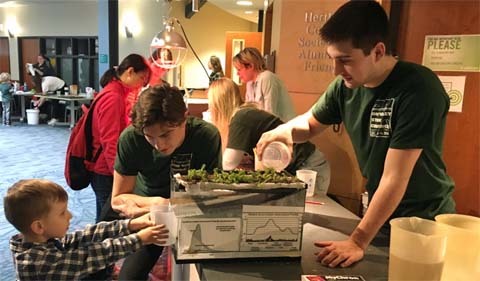 Johnny Murray and John Corcella of the Renaissance Engineers help a child collect and measure water runoff from models of green and traditional rooftops. They build this system using an aquarium, rooftop shingles and the plant, Sedum. 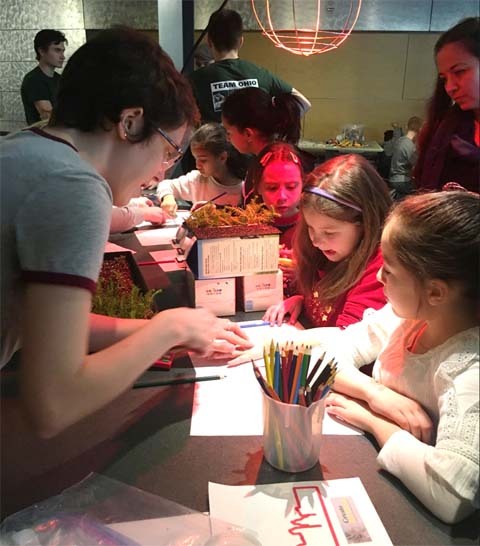 Student groups already have become involved in offering outreach activities to school groups to educate them about green roofs. Members of the Renaissance Engineers built two model systems so that children could compare vegetated with traditional rooftops. They compared the rate of water runoff from each system and graphed changes in the temperature inside each of the “buildings” as a heat lamp simulated a hot day. Rachel Modzelewski, an engineering student, helps a student compare the internal temperature of models of green roof and traditional rooftops when exposed to heat. This was first presented at the Annual Engineering and Technology Day for K-8 students by engineering and plant biology students. It was also met with enthusiasm by the New Philadelphia High School group when they met with the Environmental & Plant Biology graduate students in March. 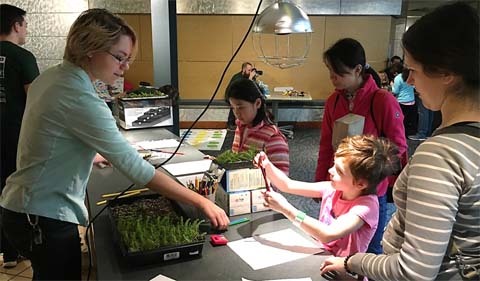 “We plan to expand our outreach to schools next year by developing larger green roof models that 6-12 grade classes can use for science fair projects and other educational activities,” said Thompson. 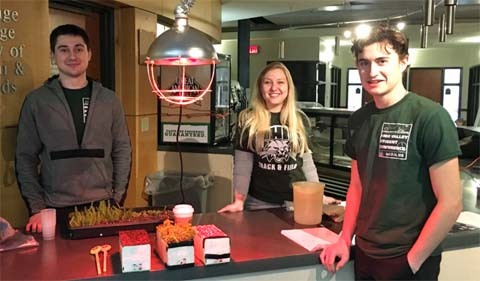 Renaissance Engineers John Corcella, Rachel Modzelewski and Johnny Murray prepare for a day of teaching students about green rooftops at the Annual Engineering and Technology Day at Russ College. Plant Biology major, Ava Hellar, teaches a student to graph data collected from temperature measurements.